This equation is commonly known as the equation of the q-line. If xq = x/, then yq = x/. Thus, the point of intersection of the two operating lines lies on the straight line of slope q/(q — 1) passing through the point (x/, x/). When yq = 0, xq = x//q. The line may thus be drawn through two easily determined points. From the definition of q, it follows that the slope of the q-line is governed by the nature of the feed as follows. 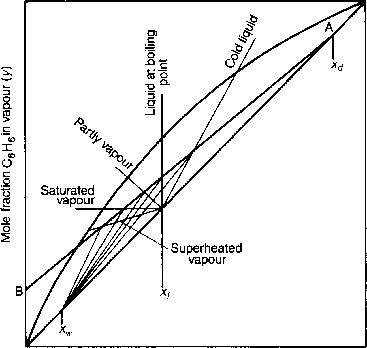 These various conditions are indicated in Figure 11.16. 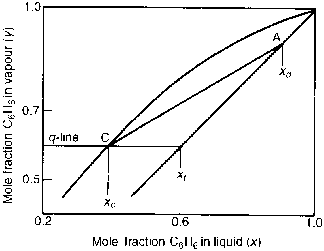 Altering the slope of the q -line will alter the liquid concentration at which the two operating lines cut each other for a given reflux ratio. This will mean a slight alteration in the number of plates required for the given separation. Whilst the change in the number of plates is usually rather small, if the feed is cold, there will be an increase in reflux flow below the feed plate, and hence an increased heat consumption from the boiler per mole of distillate. Any change in the reflux ratio R will therefore modify the slope of the operating line and, as may be seen from Figure 11.15, this will alter the number of plates required for a given separation. If R is known, the top line is most easily drawn by joining point A (xd, xd) to B (0, xd/(R + 1)) as shown in Figure 11.17. This method avoids the calculation of the actual flow rates Ln and Vn, when the number of plates only is to be estimated. from x/ to xd, as shown by the line AK in Figure 11.17. Further reduction in R will eventually bring the operating line to AE, where an infinite number of stages is needed to pass from xd to x/. This arises from the fact that under these conditions the steps become very close together at liquid compositions near to x/, and no enrichment occurs from the feed plate to the plate above. These conditions are known as minimum reflux, and the reflux ratio is denoted by Rm. Any small increase in R beyond Rm will give a workable system, although a large number of plates will be required. It is important to note that any line such as AG, which is equivalent to a smaller value of R than Rm, represents an impossible condition, since it is impossible to pass beyond point G towards x/. Two important deductions may be made. 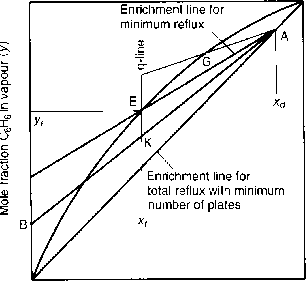 Firstly that the minimum number of plates is required for a given separation at conditions of total reflux, and secondly that there is a minimum reflux ratio below which it is impossible to obtain the desired enrichment, however many plates are used. How to draw Q line distillation? What is the significance of the reflux ratio? What will happen if reflux ratio below minimum? 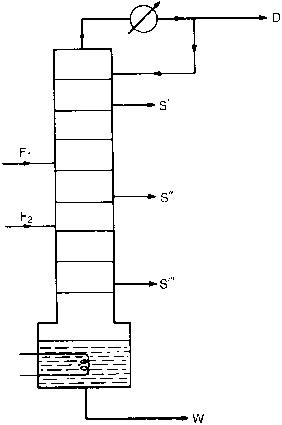 What is the importance of reflux ratio in the design of a distillation column? What is role of reflux ratio in design of distillation column? What is the significance of rflux ratio? What is the significance of reflux ratio in distillation operation?